Bonus Content for Paid Premium Subscribers. Lanna asks Comedian George Hamm 5 Questions. And he answers them. Enjoy this update from LannaLee about her trip to Kansas and whatever else is going on in her life right now. John is a Creative Cognitist, a title given him by one of his creative partners. A proud ADHD adult, he has many creative pursuits, all of which are supported by his career as an Information Security Consultant/Systems Engineer. He believes that creativity is inherent to being alive, and prefers to talk about people involved in creativity rather than "creative people". He has worked as a cook and chef, and loves working with food, especially locally produced. He is a writer of essays, short-story and poetry, currently working on a book about the human shadow, and pursuing an English degree at USM. He is a musician who studied jazz vocal in another college life, and plays the flute and drums. John has also worked as a professional coach, trainer and organizational developer, working with individuals and organizations to overcome challenges and improve. His curiosity and drive to connect dots keeps him always looking for new endeavors. His latest endeavor is a seminar entitled: Creativity and All That Jazz, during which a live jazz quartet is used to model the 5 core principals of successful organizations. A book on this seminar is also in the works. Here is the conversation BEFORE the LLLSalon: a fun, raucous rout of fantastic snarkery and profane delight. 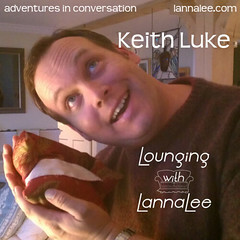 Keith Luke can be found on Twitter as @GriffinClubMerv and at Luke Photography. This is Keith's first lounge. 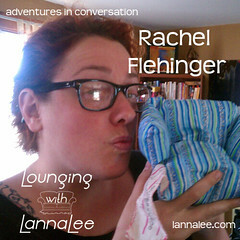 Rachel Lounged with LannaLee in LLL008 Rachel Flehinger: Siren Songs of Podcast on April 26, 2012. 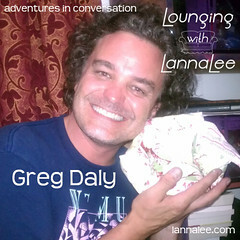 Greg Daly Lounged with LannaLee in LLL017 Greg Daly: This Podcast Starts in Westbrook on July 12, 2012. Candace Karu Lounged with LannaLee in LLL019 Candace Karu: Marathon Woman on July 26, 2012. 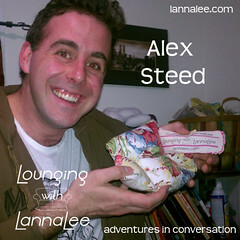 Alex Steed Lounged with LannaLee in LLL001 @AlexSteed in the Lead on March 1, 2012. John Lee Dumas is the founder of EntrepreneurOnFire.com, a daily podcast that interviews todays most inspiring and successful Entrepreneurs. The mission of EntrepreneurOnFire is to help millions, and John has started down that path, with over 100,000 downloads a month and a #1 ranking in iTunes New and Noteworthy.